Mobile High-Definition Link (MHL) is a standard for connecting mobile devices to a big screen TV or projector. It’s a 5-wire, single cable interface capable of supporting 1080p 60HZ video and 192 kHz, 7.1 audio while simultaneously charging the phone. It also allows the TV’s remote to control the device. The phone effectively becomes a mobile set-top box. Formed in April 2010, the MHL Consortium's founding members include Nokia Corporation, Samsung Electronics Co., Ltd., Silicon Image Inc., Sony Corporation and Toshiba Corporation and currently have more that 160 adopters. 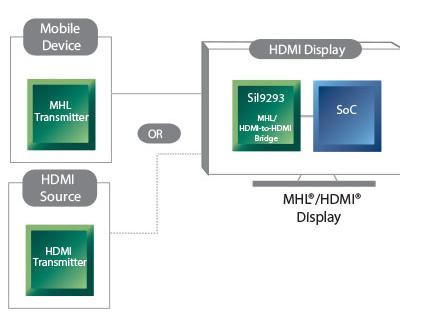 Silicon Image is one of the leading vendors of MHL chipsets and their new SiI9293 Dual-mode MHL®/HDMI® Receiver supports both HDMI and MHL on a single chip. As mobile devices get smaller and packed with more gizmos, connectors frequently change. Adding a new type of connector would be undesirable, if not impossible, for many mobile devices. For this reason the MHL spec (unlike HDMI, USB, etc.) does not dictate a specific type of connector. This means that any vendor can implement any connector they choose (e.g. micro USB, mini HDMI, etc.) and connect to a large screen device using MHL. As well as sending video and sound, and charging the mobile device, many TV’s are able to control the device with the TV’s remote using the built-in RCP (Remote Control Protocol) function. Throw in a Bluetooth keyboard and mouse and you’ve almost go a PC. With the increasing power of mobile devices and their applications, we’re almost at the point where you really could leave that laptop at the office when going on a business trip. Fortunately not. Some TV’s (such as 2102 Samsung models) are firmware upgradable. The firmware upgrade will switch an HDMI port to MHL when an MHL device is connected. For non-MHL compatible TV’s, MHL to HDMI converters, such as this Samsung product are available. I Don’t Have and 1080P 7.1 Content on my Smartphone, So What Use is It? Clearly, most people don’t have such high quality content on a mobile device like a phone, but there’s plenty of places to stream if from. For example, I could be in a hotel, connect to the W-Fi network and stream an HD movie from somewhere like Netflix or Vudu via my Smartphone. Miracast is still new and AirPlay currently only allows connection when the mobile device is connected to the same Wi-Fi network. Many corporations will not allow visitors to connect to their network, so even if they had an AirPlay device it wouldn’t be any use. With MHL, a single cable can be used for audio, video and power, so instead of having to run an extension cord from the wall to the boardroom table, the device is simply plugged into the display. By using the TV’s remote control, the user can get that lean back experience without cords training across the floor. Videos can be played, pauses, rewound just like a regular DVR, using the TV’s remote. Even Apple’s AirPlay doesn’t allow mirroring of a Phone’s screen (only iPads allow this). There are occasions (such as training, demonstrations, gaming, etc.) where mirroring of the entire screen is desirable. This is a core feature of most MHL-equipped devices. Luxury car manufacturers are reputedly looking at MHL as a mechanism for delivering video to the dashboard. MHL is an attractive proposition for mobile device users who want to leave the computer at the office or just want to relax with a lean back experience. There are many cases where Wi-Fi networks unavailable or the display to be used doesn’t have AirPlay or Miracast. MHL provides an elegant, single cable connection for high definition audio and video while simultaneously charging the mobile device.